My personal feeling is that diving could make our cruise worthwhile all by itself. While there are many things I like about life aboard, the underwater world in the tropics is a special joy to me. Even before I got certified for diving, I always looked forward to a good snorkeling site. 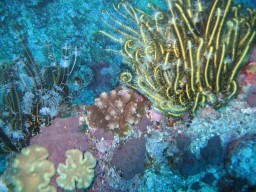 Now that we have our underwater camera, I enjoy underwater exploration even more than before. 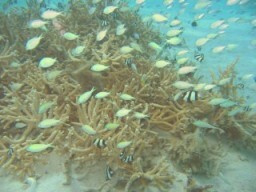 Underwater sightseeing, like sightseeing ashore, offers many different attractions depending on location. Coral reefs might have lots of fish, or lots of coral, or perhaps several sharks. Occasional wrecks provide interesting scenery even if you don't go inside (too dangerous). Some places have a nearly permanent population of stingrays, which are usually friendly if you watch where you step. Even the Galapagos, which has little coral at all, had playful sea lions and the occasional penguin! 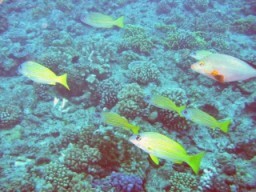 Having the underwater camera, I now wish I could go back to all the places I snorkeled and dove without it. The excitement of seeing and identifying a fish is redoubled when we have a permanent photograph of it, not to mention the aid such photos can be in identification. The challenge of taking a good underwater picture (much harder than on land) and the joy of looking over the ones we took elsewhere are their own rewards. Even without the camera, snorkeling and especially diving are real joys. Swimming on the surface of the water is nothing next to swimming beneath it, and with a mask and snorkel (or tank) it is easy to both look around and get air. I prefer diving because I can go deeper and get more bottom time than on one breath from the surface, but free-diving allows more streamlined swimming and quicker changes of depth. Either way, I enjoy the chance to see the amazing natural beauty underwater. Click here for our underwater section, including diving impressions and photos.